Zhang, N., Lin, J., Yang, Y., Li, Z., Wang, Y., Cheng, L., Shi, Y., Zhang, Y., Wang, J. and Mu, C. 2015. The tolerance of growth and clonal propagation of Phragmites australis (common reeds) subjected to lead contamination under elevated CO2 conditions. RCS Advances 5: 55,527-55,535. Writing as background for their study, Zhang et al. (2015) state that lead (Pb) is one of the most toxic heavy metal contaminants in soils, causing "a wide range of adverse effects on plant growth and physiology." Yet, in contrast, they note that elevated CO2 has been shown to alleviate its detrimental effects by "increasing antioxidant enzyme activity and photosynthesis, which increases biomass accumulation," citing the works of Wu et al. (2009), Jia et al. (2010) and Ju et al. (2011). Against this backdrop, Zhang et al. set out to examine how elevated CO2 might impact the growth characteristics and phytoremediation abilities of Phragmites australis, a plant known for its natural ability to mitigate Pb contamination, particularly in polluted wetland soils. In doing so, the team of ten Chinese researchers grew two-month-old P. australis seedlings under five Pb concentrations (0, 500, 1000, 1500 and 3000 mg kg-1) and two CO2 levels (380 or 760 ppm) for a period of 50 days in a controlled laboratory environment, after which they performed a series of measurements to determine the interactive effects of these two conditions. Based upon an analysis of those measurements, Zhang et al. 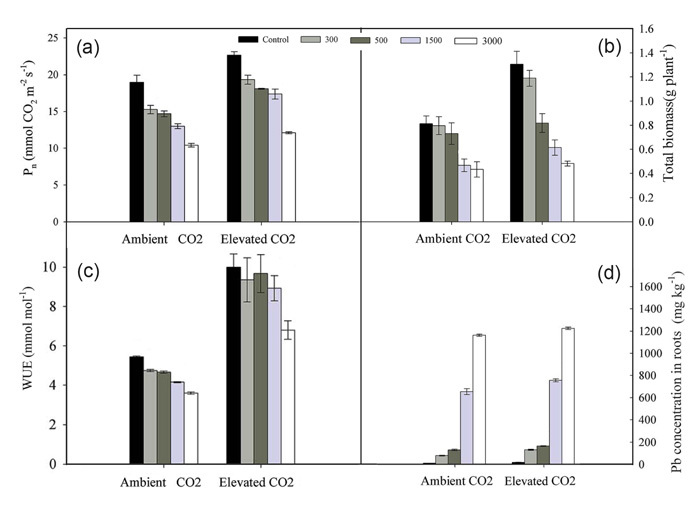 found that elevated CO2 enhanced net photosynthesis (panel a, figure below), which resulted in an increase in overall plant biomass across all Pb treatment levels (panel b). In addition, they report elevated CO2 improved plant water use efficiency (panel c), "triggered a vast amount of Pb accumulation in the root systems" (panel d) and stimulated a remarkable increase in the number of buds and daughter shoots per plant, the latter of which two increases led to an overall enhancement in "the clonal propagative ability of P. australis growing in Pb contaminated soils." In light of such findings, the authors rightly conclude that "elevated CO2 could ameliorate Pb toxicity and improve resistance capacity of P. australis to Pb contamination." And thus we see yet another example of the many benefits elevated levels of atmospheric CO2 portend for earth's plants in the not-too-distant future, as the CO2 concentration of the air continues to rise. Figure 1. Effects of elevated CO2 (ambient = 380 ppm, elevated = 760 ppm) and Pb contamination (in mg kg-1 as indicated in the legend at the top of the figure) on (a) net photosynthetic rate, (b) total biomass, (c) water use efficiency, and (d) total Pb concentration of Phragmites australis. Adapted from Zhang et al. (2015). Jia, Y., Tang, S., Wang, R.G., Ju, X.H., Ding, Y.Z., Tu, S.X. and Smith, D.L. 2010. Effects of elevated CO2 on growth, photosynthesis, elemental composition, antioxidant level, and phytochelatin concentration in Lolium mutiforum and Lolium perenne under Cd stress. Journal of Hazardous Materials 180: 384-394. Ju, X.H., Tang, S., Jia, Y., Guo, J.K., Ding, Y.Z., Song, Z.G. and Zhao, Y.J. 2011. Determination and characterization of cysteine, glutathione and phytochelatins (PC2-6) in Lolium perenne L. exposed to Cd stress under ambient and elevated carbon dioxide using HPLC with fluorescence detection. Journal of Chromatography B 879: 1717-1724. Wu, H.B., Tang, S.R., Zhang, X.M., Guo, J.K., Song, Z.G., Tian, S. and Smith, D.L. 2009. Using elevated CO2 to increase the biomass of a Sorghum vulgare × Sorghum vulgare var. sudanense hybrid and Trifolium pratense L. and to trigger hyperaccumulation of cesium. Journal of Hazardous Materials 170: 861-870.